We have wonderful news for you. KNOM is being honored with the Gabriel Radio Station of the Year Award! It’s the 17th such Gabriel for the station, and the 13th in a row. How about that? 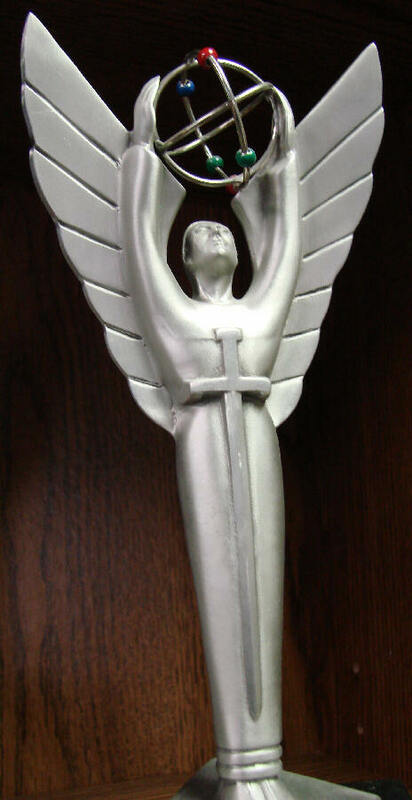 The award (left) will be presented October 25th at the Millennium Biltmore Hotel in Los Angeles. Please pat yourself on the back for your role in helping make our award-winning work possible! And…words are inadequate to express our gratitude to you. 97% of our mission’s operating expenses are paid by good people like you. If you cannot afford to give, please pray that someone who can will decide to do so. Thank you! HELPING HAND: (left) As boats from the village of Teller began to beach, they were nearly swamped by cresting waves, and everyone pitched in to pull them to safety. The location was the village of Wales, whose 136 souls were hosting an Inupiat (in-OO-pee-at) Eskimo dance festival, 109 miles northwest of Nome. KNOM volunteer Dave Dodman captured the moment, accompanying new volunteer Danielle Sylvester on her first trip to the rugged, road-less Alaska bush. We sincerely thank the Nome air carriers who continue to fly KNOM staff to distant points like this at no cost to the mission. In the background of the second picture at the right, you can see even more far-flung Little Diomede Island, on the American side of the Bering Strait. 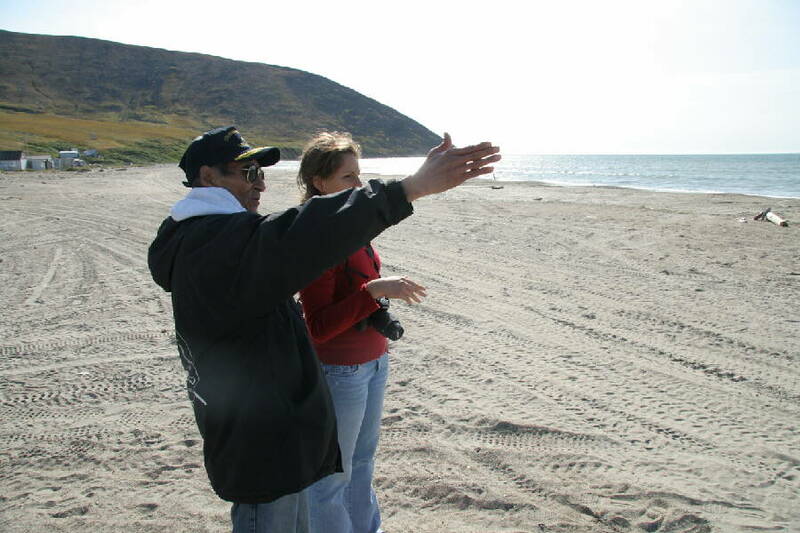 (Left) Little Diomede mayor Pat Omiak tells Danielle about his island. Undoubtedly, everyone in the photographs is a daily KNOM listener. (Left) Wales, in the heart of KNOM listening country, is located at the western tip of Alaska's Seward Peninsula. SARAH PALIN as vice presidential candidate? 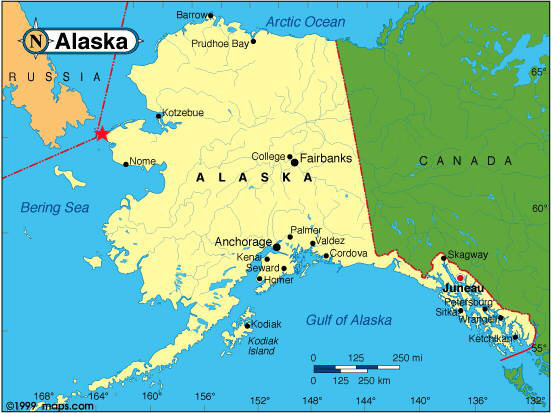 Across 100,000 square miles of western Alaska, most people learned of their governor’s nomination from news broadcast on KNOM. Thank you for helping to support this valuable service. MANY OF OUR MISSION’S FRIENDS, including staff and former staff, have written KNOM into their wills, providing a legacy that is far beyond what most of us can contribute during our time on Earth. We prayerfully accept such gifts and carefully place them into funds that provide for emergencies and for long-term improvements. INSPIRATIONAL SPOT: In looking about our world, all I have seen teaches me to trust Our Creator in all I have not seen. INSPIRATIONAL SPOT: Lord, give me common sense to make good decisions. Give me courage to overcome pressure from others. Teach me how to pray when I especially need guidance, and help me to know what to do when decisions are hard. Lord, help me to be aware of how powerful Your Presence is in my life. (Left) FR. ROSS TOZZI poses during a recent visit. He is the pastor of St. Nicholas Parish in North Pole, Alaska, near Fairbanks. “With the enclosed check,” Fr. Ross continues, “my net pay for the month of August, I contribute the first of 20 months of financial support to KNOM as a stay at home support volunteer. A year from now will mark the 20th anniversary of my arrival in Nome and thus the idea of the pledge to continue this support over a 20 month period. Fr. Ross, God bless you! YOU CAN APPRECIATE our worries about the costs of fuel and electricity, which are proportionally much higher in western Alaska than they are in any other part of the United States. Seven years ago, our costs for electric power and all utilities for the studio and volunteer dormitory were $65,847. This past year, they totaled a staggering $122,047, with $82,923 of that simply electricity for the mission’s 25,000 Watt transmitter. You can imagine our shock when we were told to expect the cost of powering the transmitter alone to approach $100,000. Thank you for staying with us. If they could, we know that our listeners would sincerely thank you also. 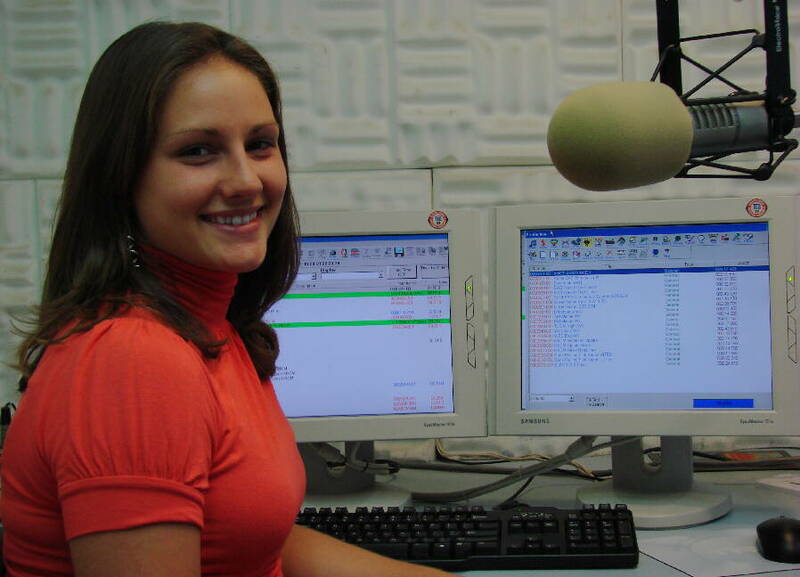 The oldest Catholic radio station in the United States, active and well, thanks to you. INSPIRATIONAL SPOT: God has created me to do Him some definite service. He has assigned some work to me which He has not assigned to another. I have my mission. I am a link in a chain, a bond of connection between persons. WE WELCOME YOU TO MEET the newest member of the KNOM family, Danielle Sylvester (left). Hailing from Buffalo, New York, Danielle is a 2008 graduate of Nazareth College in Rochester with a dual degree, communications/rhetoric and philosophy. “This is a great opportunity in a place I’ve never been, doing something that relates to my degree and gives me valuable experience,” Danielle says. She will serve as volunteer inspiration director as well as morning announcer. “People here are amazingly friendly,” Danielle continues, “and there’s so much to learn. It’s going to be an exciting year. Please join us in prayer for Lee, his family, and everyone in his firm. BOOKED AND PRINTED: He’s not only Alaska’s finest radio news director, he’s also a published author! Congratulations to KNOM news director Paul Korchin, whose book, “Markedness in Canaanite and Hebrew Verbs,” is now on sale, ISBN number 1-57506-928-8. Paul, who holds a PhD from Harvard University, conducts scholarly research in his spare time; this book raises ground-breaking questions about special endings on verbs in the ancient languages. Praise Him in the morning ere the sun shows its light. Praise Him in the noontime when the day is at its height. Praise Him in the evening as the sun sets in the west. Praise Him through the night hours and in His Presence rest. INSPIRATIONAL SPOT: Christ bids us bring His peace to the world. We are called to pass on the healing we have experienced and the reconciliation we have been given so lavishly. IT’S A SQUEEZE! 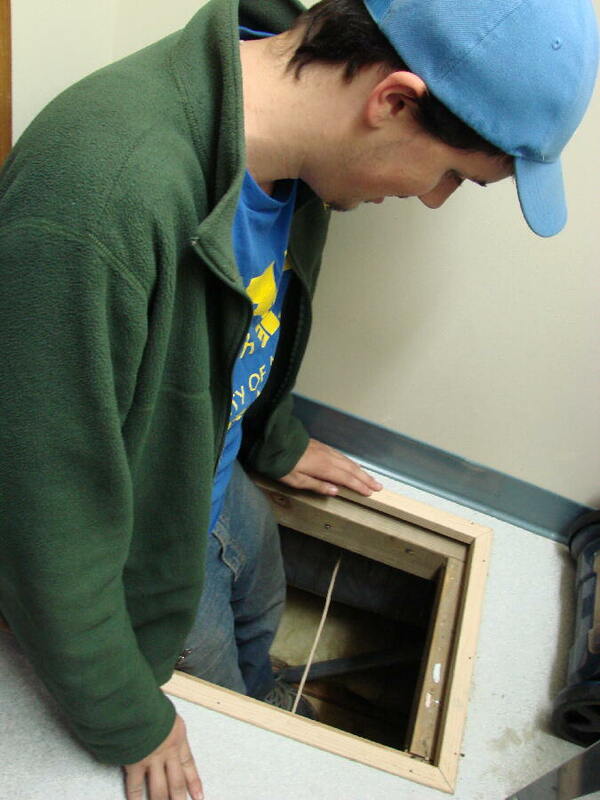 (left) Shortly before returning to college at the University of Alaska Fairbanks, Nick Schmidt ponders how to fit his 76-inch frame into the 37-inch crawl space between KNOM’s first and second floors. Nick was running computer network cables, and somehow, he succeeded! The son of KNOM general manager Ric Schmidt and business manager Lynette Schmidt, Nick is studying computer science, having cut his computer teeth at the mission in his early teens. Today, he helps solve thorny problems. Thanks, Nick! FORTY YEARS AGO: In October 1968, things look grim. The mission’s ham radio equipment has arrived, but there’s no one to set it up. 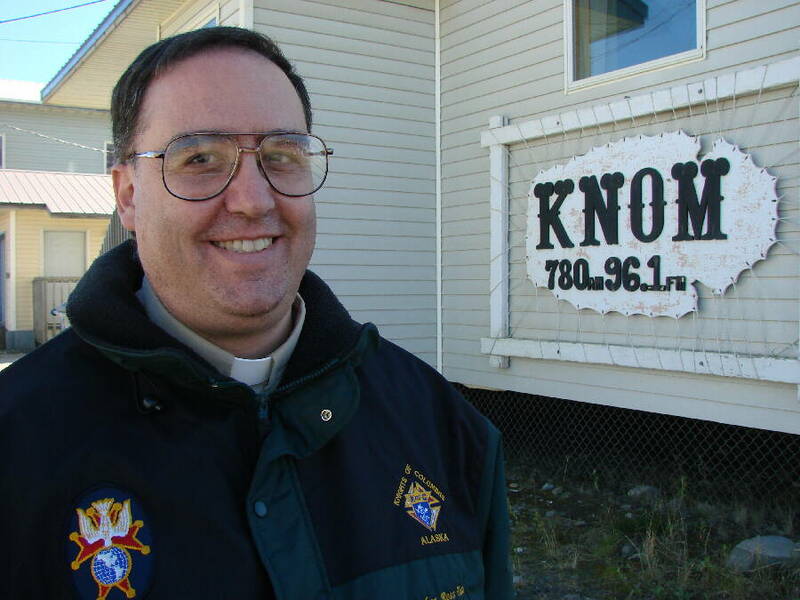 About this time, there is no end in sight to the delay in Washington, DC paperwork for the new Catholic station, and volunteer engineer Paul Deiser leaves Nome. UP FOR THE COUNT: So far this year, KNOM has broadcast about 25,500 inspirational spots, and the same number of educational spots, too, thanks to your helping hand. YOUR GENEROSITY and your prayers are what keep our mission alive. We honor you for your care and concern for the remote and largely impoverished families whom we serve. Until next time, please know that you, your intentions and those you love remain in our daily prayers. God bless!